Think EyePet meets Pokemon and you’ve pretty much summed up Invizimals: Shadow Zone. It doesn’t quite have the depth of Nintendo’s pocket RPG but the clever use of the PSP camera means that this sequel isn’t without its charms. Shadow Zone packs something you rarely see in games today, placing you as the main character and having live action cutscenes play out with actors talking to you. You’re job is to catch, train and battle Invizimals which are (you guessed it) invizible little critters. They’re hiding in your room right now, but you won’t be able to find them, no only the power of the PSP camera can do that. I realise I’m sounding a bit like a PR person here but it’s fun to get involved in the world of Invizimals. It paints a cheesy but likeable world that should be something fresh for any gamer. You can find Invizmals anywhere, the PSP camera will scan an area that you’re currently looking around and when it picks up a specific colored surface a tiny little monster will pop up for you to catch. This is done first by matching different shapes together, then calming the creature and then slapping you hand over the Invizimal. The PSP needs to be able to see ‘the trap’ (a piece of card that it can scan) to carry most of this out. Your trap will soon become your bible as you’ll always need it to see your Invizimals and battle others. Invizmals come in all shapes and sizes and there’s a wide variety to catch that all bring their own attacks and looks to the game. It’s pretty much the same idea as Pokemon from here on out with the augmented reality feature separating itself. 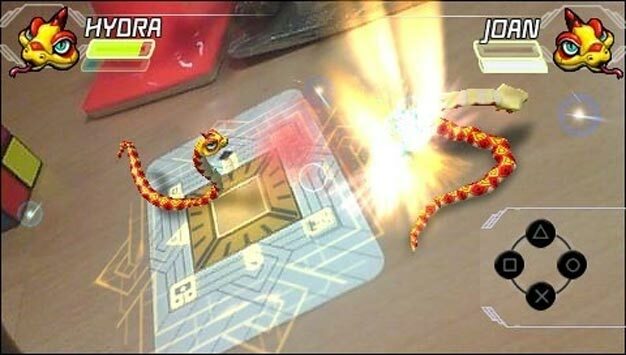 Battling against other people’s Invizmals will see you selecting attacks to perform, trying to block your enemies and even moving the PSP around to perform special moves. It’s a pretty refreshing way to play what could have been a very by-the-numbers title. The combat never reaches requires the kind of tactics seen in a Pokemon title, and there’s not as large a range of monsters to pick up (although with 100 new creatures, still a good amount) but it makes up for it with the different approach. Kids are clearly the target audience here which explains why the fighting system doesn’t go deeper than it easily could. It’s all wrapped around a story that’ll take you a good while to see through to the end and by that time you’ll really feel like you’ve come a long way. You can also take the battle to your friends although finding someone with all the same kit as you (PSP, camera and a copy of the game) is a bit of a stretch. That’s a shame because the game also offers a co-op capture mode that you’ll likely never experience. Invizimals does come off a little strange in the design department. Maybe it’s because I’m used to the super-Japanese animations of Pokemon and Digimon but the realistic approach to these animals didn’t really do it for me. If the game had relied on a more cartoony look I think it would have fit the tone much better. Still, minor gripes aside Invizimals: Shadow Zone is a whole lot of fun. It’s not the next Pokemon, not by a long shot but it does provide an entertaining alternative. It’s far more likely to hit home with your kids, but just like EyePet before it the technology proves that the PSP still have some bite left in it’s UMD-slot. – Unlikely to find a friend to play multiplayer/co-op with.